Follow On FACEBOOK for more yummy recipes & videos! Once cooled completely, this bread freezes well. It can be toasted BUT you have to watch it very carefully. The first time I tried toasting Cloud Bread, I ended up with ashes. :) It only takes a few seconds to toast so keep a close eye on it or it will burn. This recipe is very simple to make however if you are not getting optimal results, the following are a few tips to help you. Beat The Eggs Well: The egg whites should be beaten very well. When lifting out your beater stiff peaks should form and egg white will stick to the beater. Do Not Underbake: Your cloud bread shouldn’t seem moist (like an omelette would be) in the middle. The texture should be drier than a meringue on a lemon meringue pie. 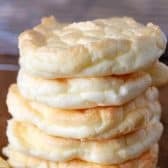 If your cloud bread is under-baked it will likely fall apart when you use it and it will have a moist eggy texture. As it sits, the texture will improve so ensure they cool completely. Cool Completely: I leave my cloud bread to cool on a rack at least 60 minutes or longer. This allows it to cool but also to slightly dry out. 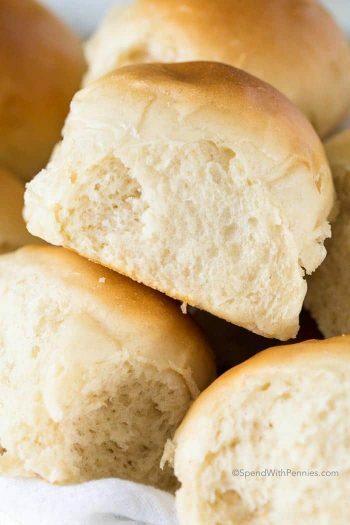 These are best eaten several hours after baking. Freeze unused portions. They defrost in seconds and last for a month or more. Preheat oven to 300 degrees F. Line a pan with parchment paper or a silpat mat. So when I mix the cup of fluffy egg whites into the egg yolk and cream cheese and fold and then pour in back into the fluffy egg whites it doesn’t get thick. It looks like runny pancake mix. 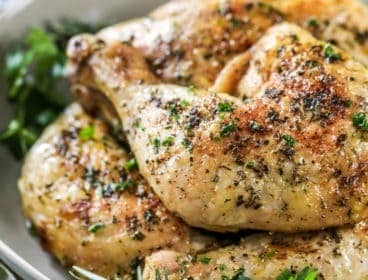 Please help I really want to make these in replace of bread. I can’t say for sure. Are you whipping the egg whites to very stiff peaks? Did you use cream cheese or yogurt? Turned out perfect and easy,egg whites must be stiff. Could make cookies with a few choco chips and nuts and a little stevia. 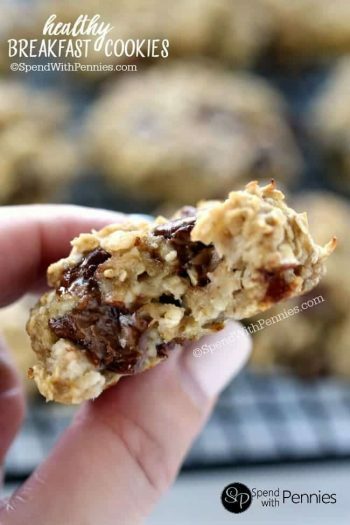 Yummy idea with the stevia and nuts!! 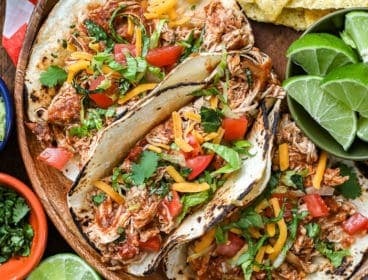 Such a fun twist on this recipe! I’m making this now, It didn’t fluff up when I mixed the egg whites with the cream of tartar. :( I went ahead and mixed the rest and put it in the oven. It seemed a little runny. I mixed it for two minutes, it never fluffed. We’ll see how it turns out. The eggs definitely need to be fluffy for this recipe to work well. Any amount of oil or yolk can cause the eggs not to fluff up properly. I hope they worked out ok for you in the end! Some recipes for cloud bread require some form of sweetener , such as artificial sweetener or honey . 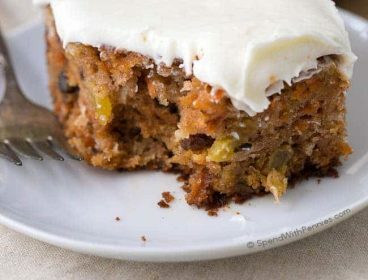 Would it be ok to use the sweetener in this recipe , or any recipe ? I have only tried the recipe as written so can’t say for sure, but some readers have added sweetener with success. Let us know if you try it Blake! My mom and I tried but no matter how much we beat the eggs, it wouldn’t get thick. We kept trying and trying. Not sure what we did. We followed the instructions at each point. If your egg whites have any yolk at all or come in contact with oil/butter they won’t beat thick and fluffy. Are you using a glass bowl? I believe they will not thicken in plastic. The bowl you beat the egg whites in, must be absolutely squeaky clean. That is absolutely free of any grease/butter or any flour. Absolutely bone dry.Plus there must be not a jot of egg yolk in the mix either. Then your eggs will form stiff peaks. Hope this helps. I have not enjoyed eating burgers with a bun in years since I stopped eating bread. GF buns always seem to be heavy and dry. But I made these with burgers tonight, and it was great! Perfect light substitute for a bun! After making cloud bread I then spread about 1 tablespoon of whipped cream cheese and use 1 slice of fat free sliced American cheese and make grilled cheese out of them. I wrap them individually in wax paper and freeze them. I pull one out the night before for a quick 130 cal snack for the morning. I love them! What a great idea Jennifer! Can I substitute the cream cheese for something different I don’t like cream cheese. Yes, Greek yogurt can be used in place of cream cheese. Is there a dairy free version? Coconut yogurt or something? I haven’t tried it dairy free, let us know how it goes if you try it! I just made it with Tofutti (tofu cream cheese, usually in vegan or organic section). It worked great. I made these yesterday for the first time. I was worried they wouldn’t taste good or they might not cook correctly. My extremely old oven runs hot, so I adjusted the temp to 275 (I cook almost everything 25-50 degrees less than recommended). I also noticed my mixture was a lot more yellow than the pictures. I used whole milk Greek yogurt instead of sour cream, because that was what I had on hand. I also made the circles the size of a standard biscuit cutter and managed to get 8 circles. And, I added about a teaspoon of Italian seasoning. I cooked them for 30 minutes, cooled them for 30, and then because I was worried they would be under cooked (I squeezed a little on the poofier parts and they sounded like eggs squishing), so I cooked them for an extra 15 minutes. My husband and I weren’t planning to eat them until today, so I wrapped them individually in parchment paper and placed them all in a ziplock bag in the fridge. To use tonight, I toasted them in a pan on the stove top, next to my turkey burger patty (I made the bread specifically to be used with our burgers). I have to admit, there really isn’t a flavor, but I’m ok with that, because I don’t really want to taste a lot of bread with my burger. I was very pleased with the recipe and will most definitely use it again. So glad it worked out well for you Jessica, thank you for sharing your tips! Italian seasoning is a great idea! Hi, i seen you said something about your oven running hot. My oven was doing the same thing and i found out how to adjust the temp of my oven. My poor oven was 90 degrees hotter then set temp. I stuck a thermometer on the center rack to check how far it was off. Set your oven and see how much difference it is from the thermometer in oven, i did 400. To adjust pull off your oven temp setting knob. Look on the back side and you should see a screw and what looks to be a sliding thing. Right now its set in the center more than likely. Losen the screw and twist where it. One way will make the temp go up and the other way drops it. Once you turn it stick it back on oven handle and see if it’s set to the temp the oven is reading. If it’s set to the same temp its reading now. Tighten your screw on the knob and you shoukd be good to go. I hope this was helpful. Kinda hard trying to explain it on here. Thanks for the tip Ashley! I made these tonight for the first time. They turned out fantastic! Had one right out of the oven with butter… Yum! Can’t wait to try for a sandwich tomorrow. Yay! Glad they worked for you Christel! Would this work with aquafaba instead of egg whites? I have only tried the recipe as written. Let us know if you try it Diane! I have only tried the recipe as written. Let us know if you try it Sheri! Thanks so much for sharing this recipe. Made them this morning and just inhaled a turkey sandwich using my cloud bread. They are AAA+++. Definitely making this on a routine basis. Yay Tracey! So glad you love it! I’m new to cloud bread……what do ppl prefer yogurt or cream cheese? Try both to see which you personally prefer. I like both, but they do have different tastes. Made cloud bread for the first time today and it worked out perfectly. Wow. 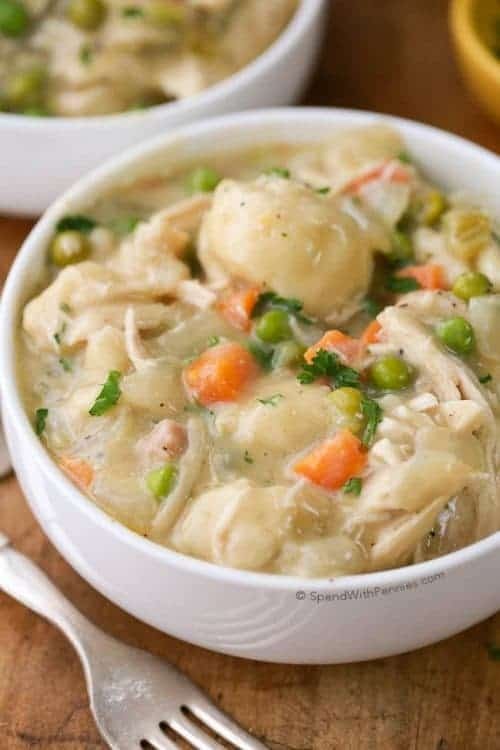 I love love this recipe. Thanks. How does this count on the 21 day fix? I count 2 cloud breads as 1/2 red. Help! I made these today and I was soooo excited! They looked GREAT and held together in my hand. Maybe felt a little spongy, and held together when I cut my sandwich in half. But when I bit in, the insides of the “bread” squished out like an undercooked omelet. Should I cook for longer? I did 30 minutes at 300 just like the recipe said but maybe a few more minutes would help? You may have underbaked the cloud bread. It shouldn’t seem moist in the middle (you don’t want an omelet texture, you want drier). 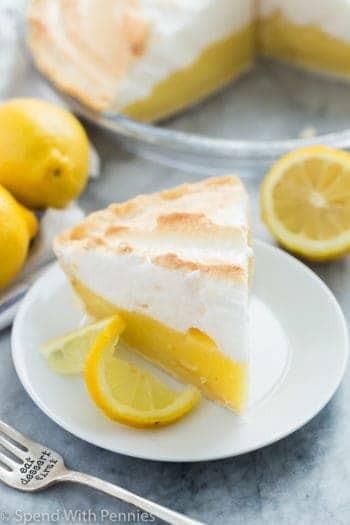 The texture should be drier than a meringue on a lemon meringue pie. If it is under-baked, it will have a moist eggy texture. As it sits, the texture will improve so ensure they cool completely. Your oven may be a little lower temperature too. Did you use an oven thermometer? Just a quick update. On the new Weight Watchers Freestyle, this would be Zero Pts per serving since eggs no longer have points, as long as you use the Nonfat Greek Yogurt. If you use cream cheese or light yogurt, you would have to account for the points. Going to give these a try as I was not a fan of the other 2 ingredient dough recipe. Have you or any followers ever tried it without the yolks? The meal plan I’m on for the next few weeks has no yolks, just whites. I haven’t, if you do try it, please let us know how it goes! Great bun or bread substitute. I think the seasoning sounds like a delicious addition! I am so glad you liked the recipe! Can liquid egg whites and egg substitute be used in place of separating the eggs? I think that should work just fine if the only ingredient is egg whites. Very easy to make. My 11 year old made this for me. On the first attempt she got a little yolk in the mix and figured out that wouldn’t work. Her 2nd try worked like a charm. The only issue is that on the nutrition info you don’t indicate if a serving size is one or two slices. Please update for clarity. Not sure if my cloud bread added 40 or 80 calories to my lunch. :) Thank you for sharing. Wow, that’s amazing that your 11 year old made this!! The nutritional info is per one slice. 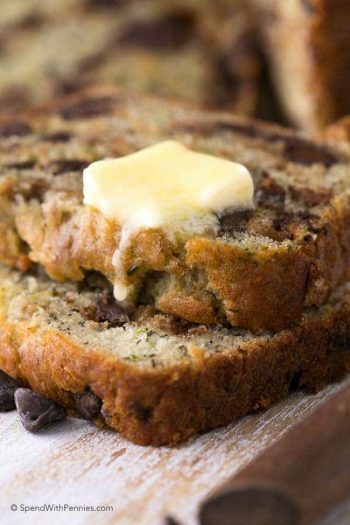 I love bread but I just made this recipe and I may never buy bread again! Thank you for sharing this delight! So glad you loved it Pat! I love this recipe. It is similar to others but the added baking time and cooling time made a big difference. I rated it as highest score but it doesn’t item what the score is. I am at your web site but no Cloud Bread recipe. Wonderful substitute for bread! It took me 3 tries to get it right but now make it weekly and freeze. I use them straight out of the freezer and they are sturdy enough to hold a hamburger. Love these! I noticed in one response you said 1/2 red for 21 day fix and in another you said 1 red. Can you clarify for me so I know for sure? Thank You!! Yikes, thank you for pointing that out! 2 eggs make one red. This recipe uses 3 eggs for 6 cloud breads… 2 cloud breads would use 1 egg = 1/2 red. Sorry for any confusion. 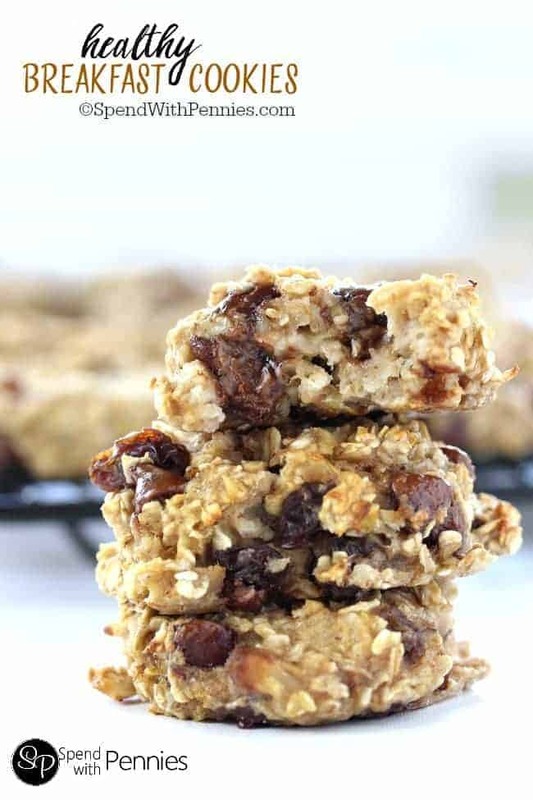 I made this recipe and it came out totally flat….do you have any ideas why? The eggs were beaten to a very stiff consistenty….I baked it for 35 minutes. I just don’t know! I can’t say for sure why they went flat, I’ve made these several times and haven’t had that issue. What kind of cream cheese did you add to the mixture? Made it using lemon juice and not cream of tartar. Turned out fantastic. Don’t recommend heating up the nest day, a toaster over drys it our and a microwave gives it a rubbery texture. 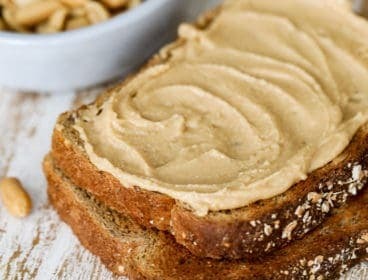 I love it for sandwiches or with cashew butter. I am wanting to make the cloud bread please. Are you able to tell me the temperature conversation for Australia please? I would suggest using google to convert the temperature. Enjoy! How many carbs per recipe? 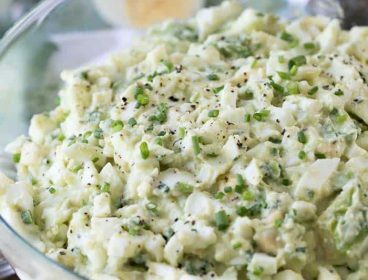 Can you use the cartoned egg whites for this recipe? I hear they dont always behave the same as manually separated egg whites. Thx! Yes, I’ve used them successfully in this recipe! Looking forward to trying this recipe. Do you happen to know the nutritional facts (calories, carbs etc.)? I can’t have an dairy so would there be a substitute for cream cheese or yogurt that would give the same effect and taste? I haven’t tried it with a non-dairy substitute. Please let us know if you find something that works for you! May i know at what temperature to bake this at? Yes this is baked at 300 degrees (you should see it in step 1 if you’ve printed the recipe). I make cloud bread – very few carbs for whole recipe. I made grill cheese out of it. Very good. Watch it closely so it does not burn. 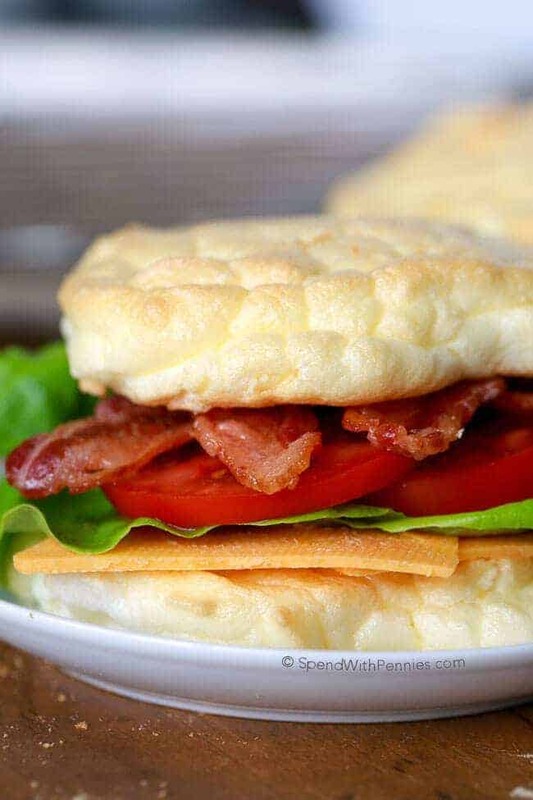 Grilled cheese with cloud bread is a yummy low carb idea! This cloud bread is so awesome. I used jalapeño cream cheese in mine and they taste wonderful. Thank you so much for a recipe that tastes so great. I’m so glad you enjoyed them! Jalapeno cream cheese is a great idea to add some extra flavor, thank you for sharing! I have tried to make these twice now and they just come out very spongy. Can’t quite figure out what I am doing wrong. Any suggestions? Thanks! The texture should be similar but a bit more dense than a meringue. If you’re having problems getting the egg whites to form stiff peaks, wipe the bowl with a little lemon juice before starting to remove any oil. Thank you for the tip Nicki! This is a staple in my home. After baking turn the oven off and transfer these to a wire rack. Return that rack to the oven and leaave the oven door open a few inches. The bread needs to dry out after baking. Once the oven is cool, remove the racks and cool further on the counter before storing in a zip top bag with a paper towel in between. They freeze great. Great idea, thank you Gia! Hey. When I mixed the egg whites & cream of tarter, it didn’t get thick like the video. So when I combine everything it’s runny. Did you ensure there is no oil or egg yolk in your bowl or on your utensils? This is interesting….i may have to try this. Thanks for the recipes I appreciate them more than you will ever know.. If a silpat sheet is not available, could parchment be used? Would it have to be greased? Yes, you can use ungreased parchment paper. Holly, here are some additional tips for meringue. Use a large metal or glass mixing bowl.. Never plastic. It is best to wash the bowl with soap immediately before using it to make sure there is no oily residue on the inside of the bowl. Dry the bowl thoroughly. Let the egg whites stand in the bowl for at least 30 minutes to allow the egg whites to reach room temperature. Even a speck of fat, oil, or yolk will keep the whites from whipping to stiff peaks. I hope these hints help you and your followers. Could you use a flavoured cream cheese like herb and garlic? Or does it have to be normal cream cheese? I think that would be a great way to customize the flavor! I found that refrigerated leftover cloud bread became sticky or tacky to the touch the next day. I kept it in a closed container — any suggestions ? I would try storing it between paper towels to reduce the moisture causing it to become tacky. I hope this helps! I am so glad you enjoyed it Kay!! Several things that would affect the egg whites not rising is if any of the yolk gets in with the whites while separating them, they will not rise. Also best to use a metal bowl and definitely not a plastic bowl to whip them up in. Lastly, if your beaters are not dry, they won’t whip up. Water is the same as the yolk in with the whites – they won’t whip up. Can you use the cloud mix directly in your waffle maker instead of baking in oven? I think that would work! If you try it, please let me know how it works out for you! I made these tonight and they were very eggy on the inside, the outside got nice and crisp but the inside didn’t cook well. You may need to lower your oven temperature slightly if they aren’t cooking through but crisp on the outside. Mirrengue… You literally just added yogurt, and made a meringue. What do these count as for the 21 day fix? I would count 2 pieces as 1 red. I apologize, 2 eggs make one red. This recipe uses 3 eggs for 6 cloud breads… 2 cloud breads would use 1 egg = 1/2 red. Sorry for any confusion. Will try this. Just found out I am diabetic. Hey! Just wondering what the portion would be for 21dayfix containers?? 1 serving (2 pieces) would be 1/2 red. Hi there, I tried these, but mine ended up flat and burnt around the edges after 20 mins. What did I do wrong? Was your oven set to 300 degrees? How long can these be stored in the fridge or freezer for? These freeze very well, I’ve kept them for about a month (and they defrost very quickly). I would suggest keeping them in the fridge for up to a few days. Just made this for the first time….they’re great! I can’t wait to have it in the morning with breakfast! I’m so glad you loved them Bridgette! If you follow this recipe you end up with a runny mess, the mixture isn’t thick enough to make any kind of dough like bread. Your egg whites should be very stiff and meringue like before adding the yolk mixture. It’s possible people could have problems with the recipe not turning out due to high humidity. 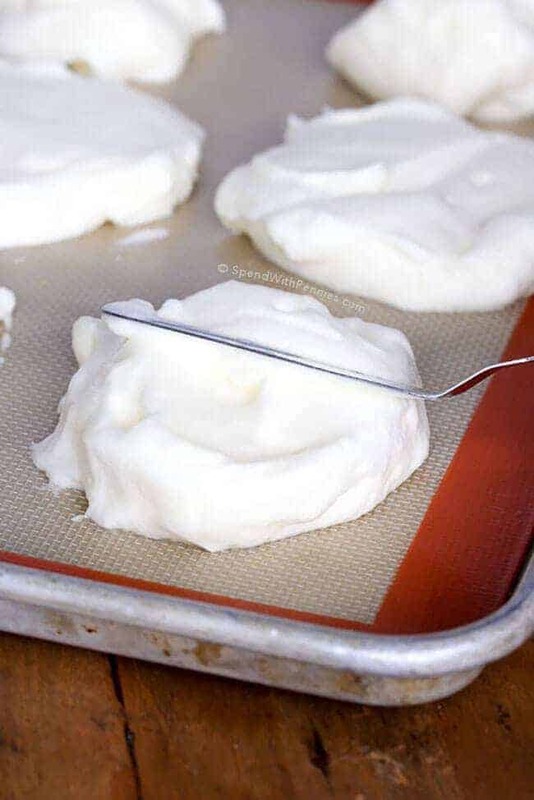 I don’t know about this in particular, but lots of recipes that are mostly beaten egg white can be affected by humidity. Try on a dry day or in an air conditioned kitchen. I might try this tomorrow! Thank you for the tip Kate! This looks so fluffy and tasty, best breakfast ever! I tried the cloud bread. Did not turn out at all. Never did turn brown, and stuck to the cooling rack. Looked more like scambled eggs. I don’t know what happened. I’m sorry this recipe didn’t work out for you. I just made them and they are cooling. They seem to have turned out. I someone ended with 5 as the sixth one was a little thinner. My fault. Pan wasn’t big enough. They are cooling. I also bake them at 350 which made them cook too fast. I did turn down as soon as realized. Making a hamburg tonight so excited to try. I would like try this recipe. Can they be used as hamburger buns? I’m not sure if they would hold up to a hamburger. They’re fairly soft. 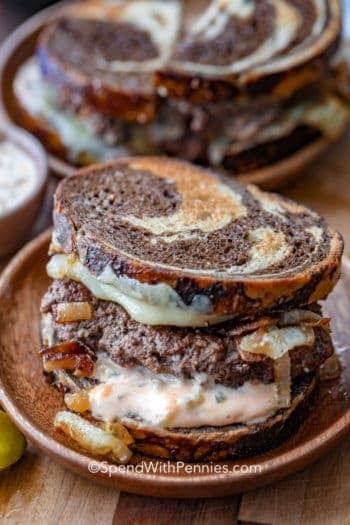 Yes I use them as hamburger buns they hold up great! I tried this recipe tonight, but I seem to have done something wrong. The “batter” was not thick enough. I beat the egg whites & cream of tartar for a very long time. It thickened but never got what I would call “stiff peaks”. Any idea what adjustment I need to make? Thanks! If your mixer has a whisk attachment, use that to beat the egg whites. If not, try a higher speed, the more air that gets incorporated, the stiffer the peaks you’ll get. I’m sure most people use stainless or glass but just to be sure, don’t beat egg whites in a plastic bowl! Thank you for sharing Brittany! Sometimes if your eggs are not fresh, recipes don’t always turn out . I had issues with mayo once. Did the it many time but once it did not work. Someone suggested I add another egg. Blame it on the eggs freshness . Be sure your cream of tartar is fresh & hasn’t past its expiration date. Want to try more recipes,love them. How simple is this?! 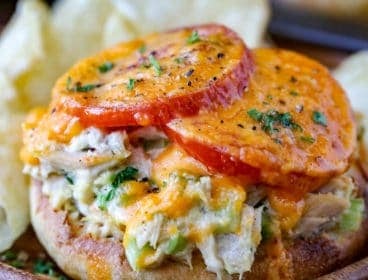 What a great way to have sandwiches without all the carbs,etc that come w/ bread. I am going to make this soon. Thank you so much for sharing the recipe! It totally looks like cloud! I wouldn’t guess that such a fun food would have that low calorie. Beautiful! Wow…never seen or heard about cloud bread … so tempting ! Is this considered to be gluten free? I don’t follow a gluten free lifestyle so I can’t say for sure. Would dairy free yogurt work? So how many carbs is in one piece ?? The brand of yogurt I used has 2.2g carbs in the whole recipe. It can vary slightly based on the brand of yogurt you use. We love these for a lighter meal! I hope you enjoy them! 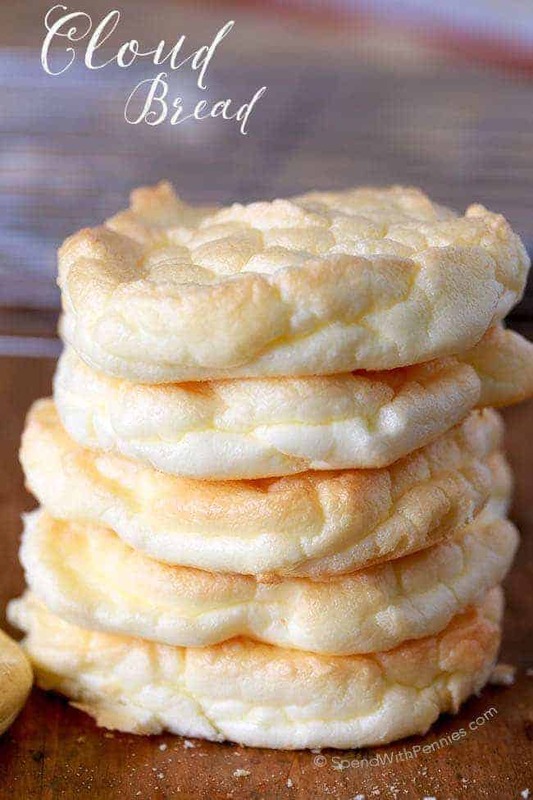 I’ve seen this on Pinterest before, the cloud bread concept, and have been totally intrigued and now I may just have to make it! Looks so good! You’ll have to give them a try, they have a nice light texture. I used to make this bread for my husband when he went on a low carb diet and lost weight. Of course it’s not as appealing as bread, but my recipe didn’t include cream cheese. That’s what makes the difference! It’s good! And I have celiac disease and can’t have gluten. So this is great for butter and fruit jam, breakfast sandwiches, dinner roll substitute, with melted cheese, scrambled bacon and eggs on top, gravy dippers, tuna sandwich, club sandwich and more. With a little almond flavoring, and powdered sugar (stevia) it’s a pretty good strawberry shortcake substitute too…just without the cake! Patty, you can check out Holly’s Easy Low Carb website for more low carb recipes! How do you make it without the dairy? Thanks!